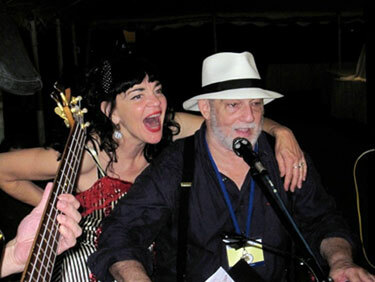 Norman Smiler Zamcheck and Suzy Williams – Stormin' Norman & Suzy, have been working together on and off (with hiatus of 16 years) since the mid 1970s. Suzy, a teenager just out of northern California, advertised in the Boston Phoenix, "Singer, red-hot mama, seeks piano player strong enough to hold on to me." Norman, an obsessive songwriter and piano player in an early blues/boogie woogie mode, took the bait. They created a totally unique and timeless sound – old, new, roots, whole-tone harmonies to blues beat, serene, bawdy; punctuated by Suzy in red boa, black velvet and her trademark coffeepot where she kept her lipstick, her "pursolater," and Norman, pumping out the rhythm and chords on the piano. Over time they added a band, toured from Maine to Florida, New York to California. Through the course of their relationship they attained some powerful media celebrity, had a swing at stardom — rave reviews in the New York Times, Rolling Stone, major record deal on Polygram Records, Carnegie Hall appearance — then, they spiraled off into hard times. Suzy movied back home to California. Norman stayed in New York City to raise a family. Fast forward. Although each have been performing separately on east and west coasts, he as Real Stormin' Norman, she as Suzy and Her Solid Senders, they missed the magic of working together. So, in the spring of 2008, they started doing brief tours together, both as a duo, and with a band backing them up. In the summer of 2011 they organized a reunion of their 1985 group in New York City. "Stormin' Norman & Suzy Live" the result of that momentus occasion, will be released in the fall. Suzy, arguably one of the greatest living female pop vocalists, is a megawatt performer. Norman, an unheralded master, both as a songwriter and a pianist, is a quirky, cult-like figure in the New York City music scene. Together they are unique, timeless and utterly original.